Hit the town in style - Green Lantern style! Features Green Lantern and DC Comics logos. Spice up that work suit! You might not be able to turn a helicopter into a dragster when you wear these things but you sure will look the part of DC's Green Lantern! Class up that tuxedo with the help of Green Lantern and these awesome Green Lantern Symbol Cufflinks. If they could wear these themselves, there's no doubt that all incarnations of Green Lantern would own a pair. 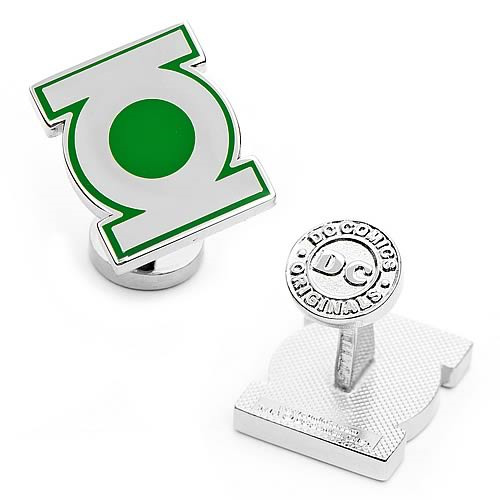 Featuring the Green Lantern symbol on one piece and the DC Comics logo on the other, this pair of cufflinks makes the perfect gift for the Green Lantern fan!